We are delighted to announce that Dr. Mark Awuku has been appointed as Assistant Dean, Faculty and Governmental Affairs, Windsor Program for the Schulich School of Medicine & Dentistry effective September 1, 2011 to August 31, 2014. Dr. Awuku graduated from The University of Ghana Medical School in 1975. He went to the Hospital of Sick Children in 1980 where he spent 5 years as a paediatric resident, associate chief resident and Chief resident, as well as a fellow in paediatric critical care. He is currently an Associate Professor of Paediatrics (SSMD), and the Academic Director of Paediatrics for the Southwestern Ontario Medical Education Network (SWOMEN). 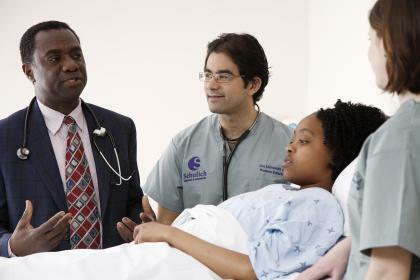 In 2008, Dr. Awuku was awarded the Green Shield Scholar of Medical Education for being a renowned medical educator and for his contributions to the development of Southwestern Ontario Medical Education Network and the success of the Windsor clerkship. Dr. Awuku recently completed his role as Acting Associate Dean, Schulich School of Medicine & Dentistry - Windsor Program. Dr. Awuku has always had a passion for teaching and has won numerous teaching awards including the LOM Award for Excellence in Clinical Teaching (HSC Toronto), Best Fellow ICU Award(HSC Toronto), Best Teacher Award (Department of Paediatrics, SSMD 2004), and Best Teacher Award for SWOMEN (2004-2008). He was also awarded the 2005 PAIRO Excellence in Clinical Teaching Award for SSMD, and the 2008 Ontario Medical Association Student Advocate Award. He was awarded the 2011 Business Professional of the Year by the Windsor Essex Chamber of Commerce. Please join us in welcoming Dr. Awuku as the Assistant Dean, Faculty and Governmental Affairs, Windsor Program, for the Schulich School of Medicine & Dentistry.